They’re coming! Oh, no they’re not…They’re coming! No, they ain’t. “Mama, there’s Rebels in town!” Here we go again…impossible. Wait, gunshots? Detail from a Mort Kunstler painting, no copyright infringement intended. On June 26, 1863 – after years of rumors and false alarms – the Confederates came to Gettysburg. And they didn’t come quietly. Civilian accounts from June 26, 1863, emphasize fear and the bad appearance of the raiders. Who were they? Why were they here? What did they want? What did they do? How did the civilians react? Who? The cavalry raiders were part of Junkin’s brigade (did I just see your eyes start staring?). Translation: they were not part of the “elite” Confederate cavalry. This accounts for the “dirty” appearance and “rougher” manners. A common belief is that it was just a cavalry raid on June 26. False. There were infantry regiments and they happened to be some of those with the worst reputation in the Confederate Army of Northern Virginia. Luckily for the Gettysburg civilians, the infantry were mostly kept out of town and away from the liquor. Why? General Robert E. Lee, commander of the Confederate Army of Northern Virginia, had invaded the northern states of Maryland and Pennsylvania. All over lower and central Pennsylvania, brigades and divisions of infantry (foot soldiers) scurried, securing strategic roads and towns, enjoying the fruit in the orchards, collecting horses, and getting ready for the next big battle. General Early’s brigade – like others throughout the state – came to Gettysburg looking for information and supplies. However, other cavalrymen scoured the town and countryside for any horses which had not been sent away and hidden in the mountains. Unfortunately for the farmers, the gray-clad raiders were quick to take the strong, well-bred horses for their own use. Overall, there wasn’t much damage to the town. The railroad bridge was burned over Rock Creek northeast of town. I’ve found no record of civilians being injured or mistreated. The next morning – June 27 – both Confederate cavalry and infantry moved on. But in a few days, they’d be back. Ever watch a crowd of people react to something surprising? They’ll all react a little different; some will gasp, others will smile, one will jump up and down, another claps her hands, and one fellow is trying to figure out why all the excitement, etc. etc. etc. Now imagine Confederate raiders arriving unexpected in a 19th Century “Union” town. You guessed it! The reactions were varied. The town leaders responded fairly calmly. As a general rule, the ladies were shocked and very frightened. The little girls were ready to hide. A couple of boys thought it was the greatest thing ever and the closest they’d ever see to a Wild West show. However, to make an “blanket statement:” As a whole, the civilian population of Gettysburg was surprised by their Confederate “guests.” They were caught unprepared and moments of panic followed. There was general relief that the town wasn’t burned and no one was injured. They believed their war experience was over. But in reality…it was just beginning. P.S. 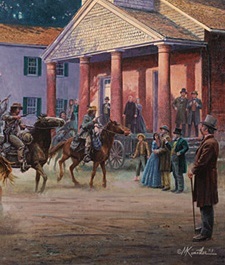 What would your reaction have been to the June 26th Raid if you were a civilian in Gettysburg? Just for fun, leave your answer in a comment.